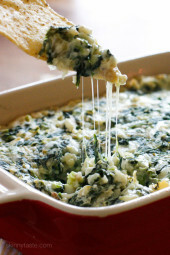 Sauteed spinach combined with rice makes a delicious side dish I just can’t get enough of! This is one of those side dishes I make when I need to go shopping and don’t have much left in my refrigerator. I always keep frozen spinach on hand for emergencies. In a small heavy pot, melt butter. Add rice and saute about 1 minute. Add water and bullion and bring to a boil. When all liquid evaporates, reduce flame to low and cover. Shut flame off and keep covered another 5 minutes to let the steam finish cooking the rice. Meanwhile, in a saute pan, heat olive oil. Add spinach and salt, mixing well for about 4 minutes. 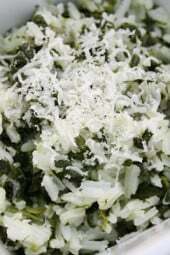 Toss rice with spinach and top with good grating cheese like Pecorino Romano. Would this work with frozen cauliflower as a rice subsititute? How much should I use? Thanks! How much broth do you use for this recipe? How much broth, one cup or one cube? 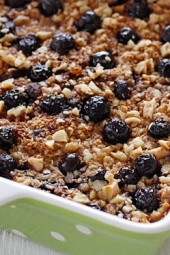 I just made this… We loved it and will be making it again! This was a delicious, healthy side to add to our dinner tonight–we loved it! Easy and quick to make, and a good compliment to practically any entree. Thanks for sharing! Do you think this would be ok if I made it ahead, put in refrigerator and then warmed it in the oven before serving? Do you think it would make the rice mushy? I've been making this for a few years now, but never commented….One of my favorites from your site!!! I just made it for lunch with some homemade crumbled sausage on top, so delicious!! I think I love it more every time I make it 🙂 Sometimes I double the spinach just because I love it so much. Thanks Gina! Can I substitute fresh spinach if I don't have frozen? Do you need to squeeze the spinach dry or does the sauteeing handle the extra water? Just made this with fresh kale, so good! What if you are using quick cooking rice? How would you adjust the cooking then? So delicious! I did the rice fully in the microwave, including melting the butter and sauteing the rice while using your proportions with chicken broth instead of the cube. My family was crazy about this dish, along with your recipe for crispy toasted sesame seed chicken breasts. 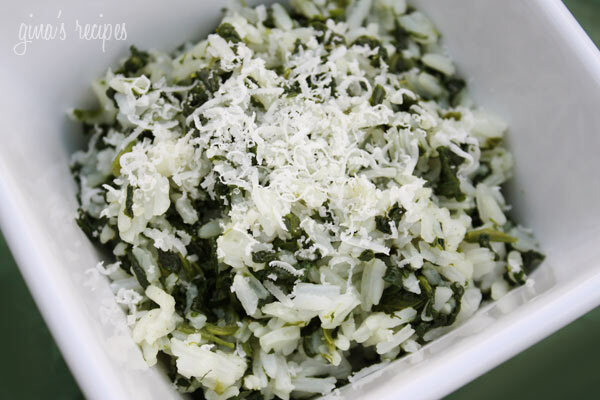 Gina, this is a healthier version of the spinach rice my Greek mother makes. 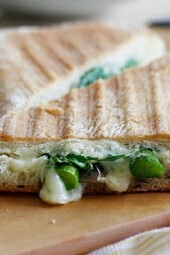 It's great; I topped it with a squeeze of lemon and a sprinkle of feta. The next day I had it cold with some halved grape tomatos and chopped cucumber. Delicious! Love your recipes. I guess it does, Gina. btw, it was delicious! definitely a keeper! No. You shouldn't cover it until the water is almost evaporated (just skimming the surface). Does that make sense? "When all liquid evaporates, reduce flame to low and cover. Cook about 15 minutes. " This doesn't make sense to me. Shouldn't it say to cover until liquid is absorbed? Just made this for dinner, delicious!! Thanks for all the great recipes!! Can you tell me the points plus for this, pretty please? This is going to be my side dish for Thursday. Holy cow was this good!!!!! Both of my daughters normally say "ew" to anything green, but they LOVED this! It was so delicious!!! Cheese options can change the flavor too…I like it with Feta. Great idea using other greens! We love this rice and we have it at least once a week. I have used kale or collards in place of the spinach. I just use any greens that I happen to have. Love it, thanks! Just made this tonight with steak and steamed veggies. Very easy and delicious. What a great way to get my kids to eat spinach. Thanks!! Can't wait to try more of your recipes! Just had this for dinner with some steak and steamed veggies. It was so easy to make and tasted great! I'm excited to have found another way to get spinach in my kid's diet. Thanks!! We absolutely loved this! Thank you for sharing a wonderful recipe! Wow this website is a massive help! ive just started to follow the WW diet and this has inspired me to cook! Delicious again Gina, lucky me: I've got spinach and rice, I'll try it tomorrow, yummm!! That looks delicious. Lori has a great idea making it with a mojito or two. Fab idea. This sounds great and I think the fiancée will approve too! Thanks for sharing.